2012 Olympics | Fit Girl. Happy Girl. Training isn’t always easy. In fact, I’d like to argue it’s never easy. But isn’t that why we do it? To push our limits and challenge ourselves? I think so at least. But sometimes when injuries happen or you have a bad run, it can be hard to keep going. Self confidence can get low and doubt can rear it’s ugly face but if you have surrounded yourself with a support team, a team that believes in you no matter what, you can push through the doubt and continue going. I have been lucky enough through my training to have a massive support team in the form of family, friends, fellow run bloggers and complete strangers. After overcoming (fingers crossed!) some IT Band issues, I have never been more grateful for the amazing people in my life who believed in me and dragged me through my own stint of self doubt. Sometimes we don’t do as well as we had hoped but at the end of the day, if there’s someone cheering for you at the finish line, or dragging you across it, you know you’ve accomplished something. Happy running this week! Kara Goucher and Shalane Flanagan were the definition of team at the finish line of the London 2012 Olympic marathon. We all know that training can be hard and there are times when we may think, I just want to rest! But it’s important to remember why we set goals for ourselves- to challenge our body and our minds. While the Olympics are so inspirational and make me feel like I can get out there and run a marathon in 2:23:07 (which I most DEFINITELY cannot), I also know I will never be at that level. But i can find comfort in knowing I am challenging myself and I can get to my own level of achievement, whatever that may be. I liked this saying in the pin below because while we may not turn out to be Olympians, we are still achieving more than those who never start. Happy running this week! This was quite a crazy training week. It involved only three days of running unfortunately, one race and a whole bunch of yoga and strength training. Monday was technically a rest day so I decided to do my typical rest day routine of recovery yoga and core exercises. It was uneventful but a good workout. Tuesday I planned to run a tempo run after work but I ended up having to stay at work much later than usual and consequentially got stuck in traffic so I decided to nix the run because I was exhausted. Instead, I came home and did some core exercises and rest up for the next day. I really enjoyed the pick-up run because it pushed me to test myself and my speed. I was able to keep up an intensity level of ‘8’ during each interval. After running, I did a whole bunch of strengthening exercises with my sister, including some lifting. As a runner, it’s just as important to build muscle as it is to work on speed and mileage. Muscles will help your body respond to runs and support your joints. Thursday I woke up early and did a 3-mile run that included some hill workouts. It went really well but after the run, my right knee was bothering me a little. I did some post-run stretches which seemed to ease the pain. I took a break on Friday with some power strength yoga and core exercises, which was perfect because it was a long week at work so it felt great to relax and sweat it out at the same time. I also had to gear up for the opening ceremonies of the Olympics! Post Color Run color madness! Saturday I had to wake up super early to get ready to run the New England Color Run in Amesbury, MA (post to follow). In short, the race was tons of fun! 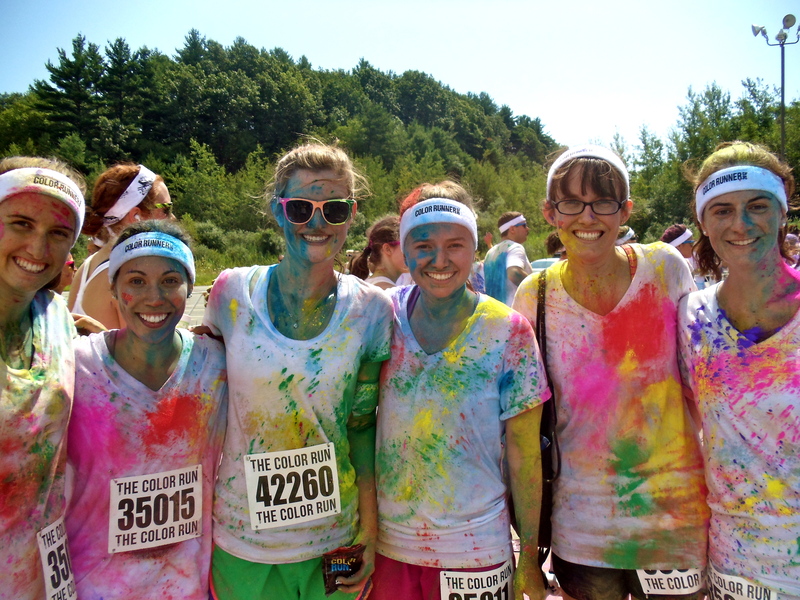 I ran it with a group of friends and we were doused in color. We came away with some great photos and memories. Unfortunately, I also came away with a pretty significant knee strain on my right knee. I’m hoping it’s just a strain and nothing serious but it’s pretty painful right now. Due to the knee strain I decided to make the smart decision to skip my 12-mile run I was supposed to do today. I still have two months until the Smuttynose Half Marathon and risking injuring myself even more is not worth it right now. I was bummed though because I’ve been looking forward to this run all week. After icing my knee all morning I went to the gym and did some cross training (3 miles on the elliptical in 25 minutes) and then a ton of strengthening exercises for my arms and core. 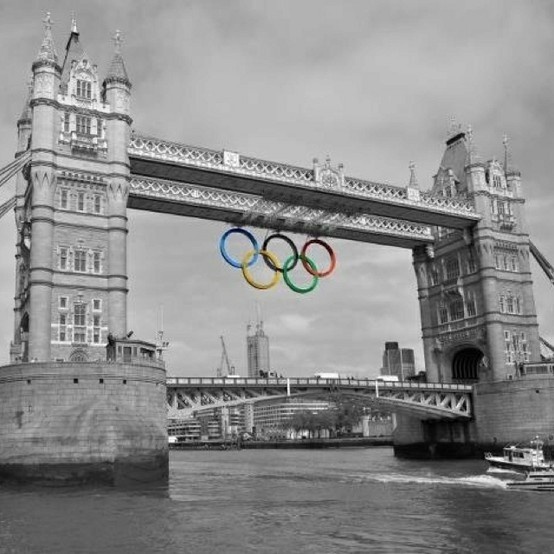 I am so excited that in less than two hours the 2012 London Olympics will commence! There’s nothing more inspiring than watching the world come together to celebrate the amazing triumphs of the greatest athletes the world has ever seen. I have been looking forward to this for so long and I’m so excited it’s finally here! Of course I am most excited to watch the track events and the marathon because, as many of you know, I’m a little obsessed with running. 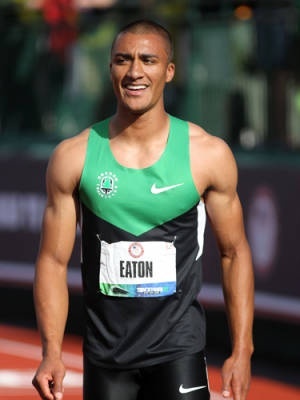 I also SUPER excited to see my favorite all-around athlete (literally he already set the world record for the decathlon so he’s kind of a beast) Ashton Eaton. I may or may not also have a giant crush on him, but who doesn’t? Besides running I’m looking forward to being able to watch some of the other sports we don’t get to see too often like swimming (Team Phelps!) and gymnastics (which I used to do but was never really good at). There are also the other random sports that we really never get to see like steeplechase and competitive sailing- I bet you didn’t know sailing was even in the Olympics, oh it is! Most of all, watching these phenomenal athletes always inspires me to try my best at everything and give everything I do 100 percent. Since I’ve started running I’ve always been focused on a goal, first it was a 5k, now it’s a half-marathon, and I’m sure pretty soon I’ll be gearing up to run a full marathon. But with the Olympics finally here, I know that these athletes will inspire me to really focus on my training and strive to become better. In the process I hope I can help and inspire other new runners to do their best. Most of us are never going to be Olympic athletes, but it’s not about showing the world how good you are at your sport, it’s about proving it to yourself. I hope y’all enjoy watching the Olympics as much as I know I will! Go World! In the comments below, tell me how the Olympics inspire you, who your favorite athlete is, or what event you’re looking forward to watching!